President Rodrigo R. Duterte meets Miss Universe 2015 Pia Wurtzbach in Malacañan Palace (Image by: Presidential Communications Operations Office). Miss Universe is an annual International pageant run by Miss Universe Organization. This pageant is one of the most awaited and publicized beauty pageant and is held in more than 190 countries worldwide. It was founded in 1952 by the California-base clothing company Pacific Knitting Mills and Miss universe organization and the brand is currently owned. The title “Miss Universe” was first used by the International Pageant in 1926. The first Miss universe Pageant was held in Long Beach, California in 1952 and Armi Kuusela from Finland became the first title holder of Miss Universe. 1. The Miss Universe 2016 is organized by Miss Universe Organization along with the Philippine Department of Tourism (DOT) and LSC group of companies. The Miss Universe representatives , DOT, and private sponsors signed a partnership contract on November 16, 2016. 2. 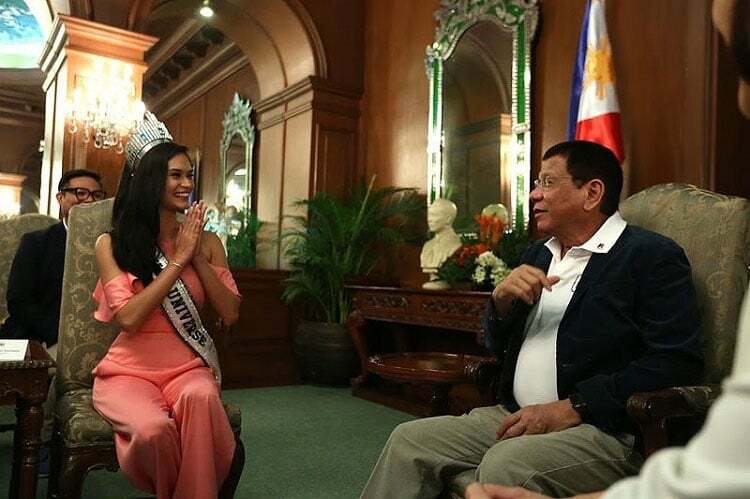 On July 18, 2016 Pia Wurtzbach made a courtesy call with President Rodrigo Duterte to discuss the plans to host the next Miss Universe in the Philippines. Duterte was initially open to the idea but refused to shoulder the expenses through government funding. Duterte also clarifies that he was never opposed to the idea of hosting the pageant but only had concerns about financing the said event. However, Duterte has approved in principle Tourism Wanda Corazon Teo’s proposal to host the upcoming Miss Universe in the Philippines. Duterte agreed that sponsoring the pageant will come to a private sector and this would be a good tourism marketing coup with Philippines’ Miss Universe Pia Wuztbach and the helm. 3. Later it was reported that plans to host the pageant in the Philippines were cancelled several times due to undisclosed reasons. The DOT had to send officials to the United States to ensure that the Philippines will be hosting the pageant. 4. On December 4, 2016, it was reported that the hosting rights of the Philippines was cancelled due to President Duterte’s controversial remarks towards US President Barack Obama and comments on plans to separate ties of the Philippines with the United States. 5. Chavit Singson, is the biggest investor in the staging of the Miss Universe Pageant in Manila. His group shouldered about $12.9 million for the Philippine event. Singson was also the reason why Philippines regain hosting rights since he argued that his credibility and the reputation of the Miss Universe brand will ruined if it gets cancelled. He sent a representative along with some of his Jewish companions to convince Emanuel to push with the event. 6. According to Singson it was the Jewish community that convinced the Miss Universe owners to push with the competition in the Philippines. 7. Emmanuel’s (the owner of Miss Universe) brother Rahm Emanuel served as White House Chief of Staff for President Barack Obama. Singson hinted that there may have been politics involved on the nearly cancellation of hosting the pageant, since Duterte’ s frequent target is the American President. 8. Chavit plunk down $12 million for the 2016 franchise. Organizations had been seeking sponsors, but many companies turned down the offer. The local partner would have to advance a non-refundable $12 million before the contract signing and provide a bank guarantee. Half of the money will go to the Miss Universe Organization, while the rest will pay for the production, food, accommodations and airfare. 10. This is the third time that the Miss Universe Pageant will be held in Manila . The first time it was held in manila was year 1974, when Miss Universe 1973 Margarita Moran crowned Amparo Muñoz of Spain. In 1994, the pageant came back in the country, when India’s Sushimata Sen was crowned by Miss Universe 1993 Dayanara Torres. And now, Maxine Medina who was crowned Miss Universe Philippines 2016 by Pia Wurtzbach last April will be the country’s representative in the upcoming pageant to be held here in the Philippines. 11. More than 80 candidates will compete the annual pageant from different countries. 12. The Philippines has already produced three Miss Universe Queens- Gloria Diaz in 1969, Margarita Moran in 1973 and Pia Alonzo Wurtzbach in 2015. 13. The 65th Miss Universe Coronation Night tickets are now available at smtickets.com and over-the-counter at SM Tickets outlets starting December 20,2016. 14. The Coronation Night will be held at 8:00 am on January 30, 2017 at the Mall of Asia Arena, Pasay City. 15. The official ticket range from P2,000 for general admission tickets, P4,800 for Upper Box, P23,800 for Lower Box B, P25,800 for Lower Box A, and P50,000 for VIP. Prices are inclusive of standard ticket charges. 16. Tourism Secretary Wanda Teo announced on Monday that the candidates will start arriving in the country on January 12 with the official pre-pageant activities kicking off on January 15. There will be a photo shoot on the 15th in Vigan. On the 16th there will also be a Governors’ Ball at SMX where all the candidates will be there. The swimwear competition will be held at Jpark Island Resort and Waterpark in Cebu on January 17. 17. The candidates will be divided into groups and will be brought to different parts in the Philippines. Locations included in the schedule of activities are Baguio, Albay, Batangas and Iloilo. On January 21, the Miss Universe candidates will converge for a fashion show at SMX Convention Center. A “women empowerment night” will be held in the same venue the next day. And on January 23, they will pay a courtesy call on President Rodrigo Duterte in Malacañang followed by another event at Conrad Hotel. While the Miss Universe National Costume competition will be held on January 24 at the World Trade Center. However, the pre-pageant evening gown contest are still finalizing the event’s date and venue. 18. The fashion showcase will be held on January 19 in Davao City and will feature Mindanaoan textile. However, the designs that the candidates will wear are made by Batangas-born Renee Salud. According to tourism officials, the Miss universe fashion show in Davao City will push through after being cancelled to prevent controversies. Since designers from Davao were disappointed as they were not asked to dress the candidates at the cultural fashion showcase. The show was put back after their meeting on Saturday between tourism officials , Davao designers and representatives of veteran designer Renee Salud. The Davao designers allowed to dress up 10 candidates for the event. However, Aztec Barba, President of the Davao Fashion and Design Council Foundation Inc. (DFDCFI) and her colleagues will still be negotiating to dress up more pageant candidates. 19. Despite of the last year’s mistake in announcing the Miss Universe winner. Steve Harvey will be returning to the Miss Universe stage as host of the show in 2017. The competition will air on Fox on January 29 which will take place in the Philippines. One of the purpose of this prestigious pageant is to promote the beauty of the Philippines as well. President Duterte also believes that the this would be a good tourism marketing coup for the Philippines.